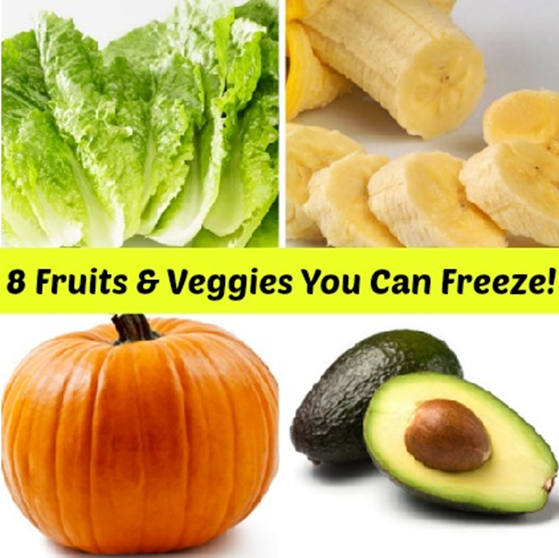 8 Fruits & Vegetables You Can Freeze! You are here: Home / DIY / 8 Fruits & Vegetables You Can Freeze! So, I wrote a post a while back entitled: What Groceries Can I Freeze?. The post was about what groceries I freeze on a pretty regular basis. Well, I have gotten a lot of questions asking about vegetables and fruits that you don’t normally see frozen. So, I thought we would discuss what fruits and vegetables you can freeze and how. To freeze lettuce, wash it under warm water and make sure you pat it dry with a paper towel. You need to get as much of the water off as possible. Then, just put it in a freezer bag and make sure to press all of the air out. Tomatoes need to be blanched before freezing them. Blanching is when you boil and then flash cool a produce item. Bring a large pan of water to a boil, cut a small (not deep) “x” in the bottom of the tomato for easier peeling when you’re done. Place the tomatoes in the boiling water, cook them for about 1 minute or less until you see the skin begin to rip open, then take them out and place them in a bowl of ice water. When you can handle them without burning yourself, finish peeling the skins off of them. Then either chop, slice, half, or quarter them, whichever you prefer and place in freezer bag. Avocados need to be pureed to freeze correctly. Use your food processor or blender to puree them and then store them in freezer bags. They won’t do right to chop or slice them and freeze them. You can also freeze guacamole. To freeze onions, you’ll need to peel and dice them and then store in freezer bags. To freeze a pumpkin, you’ll need to puree it and then store in freezer bags. Bananas make great frozen treats, too! You’ll need to peel them, slice them, and then dip them in a mixture of cold water with about a tablespoon of lemon juice, to keep them from browning. Then place them on a cookie sheet lined with wax paper, once they are frozen you can transfer them to freezer bags. You can freeze seedless green or red grapes. Just place them (dry) on a cookie sheet lined with wax paper. Once they are frozen you can put them in freezer bags and place them back in the freezer. They are also a great frozen treat. You can freeze apples whole, chopped, or peeled. Just freeze them (dry) on wax paper on a cookie sheet, then put them in freezer bags when they are frozen and return them to the freezer. You can freeze most melons the same way. Slice them very thin and place them on wax paper on a cookie sheet, once frozen, place them in freezer bags and put them back in the freezer. They are great for smoothies! So, there are eight fruits and vegetables you can freeze. So, when you find a great deal on produce – don’t be afraid to purchase a large quantity because you can freeze the excess for later! Why not just skip the pre-freezing and put fruits in bags and THEN freeze? I am not sure what “pre-freezing” you mean? Each vegetable needs to be handled differently to freeze properly. By pre-freezing I am assuming you mean the step where you freeze the item on a pan, then transfer it to a bag. This is done so the natural liquids in the food item will not cause them to stick together during the freezing process. Once they are already frozen they can be transfered to a bag without sticking together. If you don’t care if they stick together in a massive clump then feel free to skip that step. Can frozen lettuce still be used for salads, burgers, etc., or does it turn brown or get soggy? Yes, what do you do with the lettuce? I mean, how do you prepare it after you froze & thawed it? You just take it out and let it thaw out and it’s ready to use. Can you eat the apples once unfrozen or do you recommend only using them for baking? You can eat them, but they usually won’t be as crisp as they were prior to freezing.